The economic calendar is quiet this week, but the second half of the week features several key reports. Economic news doesn’t begin until Thursday with Weekly Initial Jobless Claims, which have been below 300,000 for eight straight weeks. On Friday, Retail Sales will be released along with the Consumer Sentiment Index. As you can see in the chart below, Mortgage Bonds improved after the October Jobs Report was released. 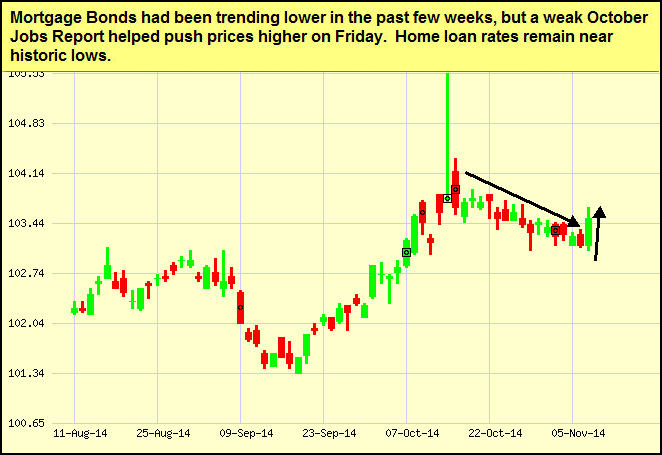 Home loan rates remain near historic lows and I will continue to monitor their movement. Why Are You Using LinkedIn? Being on LinkedIn is all well and good, but unless you know why, you can easily get stuck in an unproductive web of meaningless connections. 1. Target: LinkedIn is a great way to target potential prospects and allies. Given that targeting relies on introductions from your existing connections, make sure you only accept invitations from people who know you well enough to broker an introduction for you. Targeting someone who’s not in your network? Consider upgrading to a Business Premium or Sales Navigator account. 2. Attract: If you have a unique practice or specialty that is likely to be sought out, you don’t have to limit your connections in the way a “targeter” would. Accept invitations from anyone who could have access to relevant business opportunities. Join groups that align with your areas of interest and expertise. Statistically, participation in groups is at least three times more likely to drive relevant traffic to your profile. 3. Broadcast: Trying to make a name for yourself? Connect with anyone whose opinion matters to you. Post content such as articles, blogs and announcements to your feed on a regular basis so that the people in your network become more aware of you. When you post to a discussion group, ask a provocative question that will engage your audience. 4. Service: If your goal is to use your LinkedIn connections to add value to your clients, make sure you are connected to your clients. Ask them regularly about their problems so you can marry content and connections to their needs. This is a good way to let them know that you are focused on their problems. Chances are you want to get something out of LinkedIn (besides spam), so decide on your intended outcome and start linking accordingly.